Halloween is soon approaching, and all the little ghosts, goblins, and princesses will be knocking on doors for treats. As your little ones collect their bags full of candy and skip off home anticipating eating their loot. 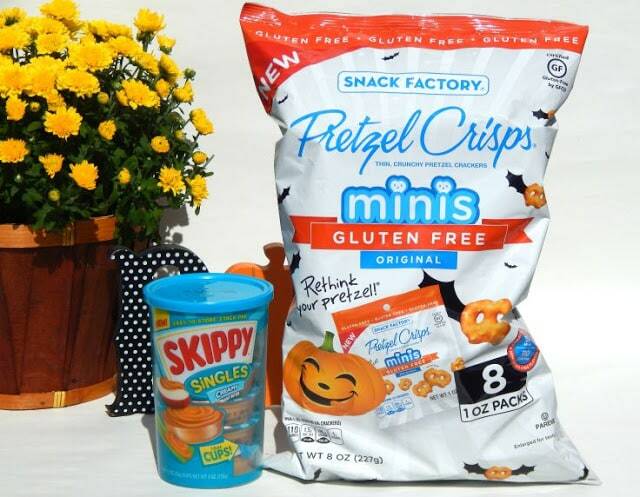 Some children that go trick or treating can’t eat everything in their Halloween bags because they can’t have gluten in their diets like my friend’s daughter. I decided to make Gluten-Free treat bags using Skippy Peanut Butter Singles. When I saw the Skippy Singles Creamy Peanut Butter in the box , I received as part of my participation in the Hormel Foods Extended Family Blogger program I knew the single cups would be perfect to put in Halloween Treat bags. Skippy Creamy Peanut Butter is Gluten-Free, it’s on the back of the container. You should always read labels on a product before purchasing it or giving it to a child or person with food allergies or food restrictions. 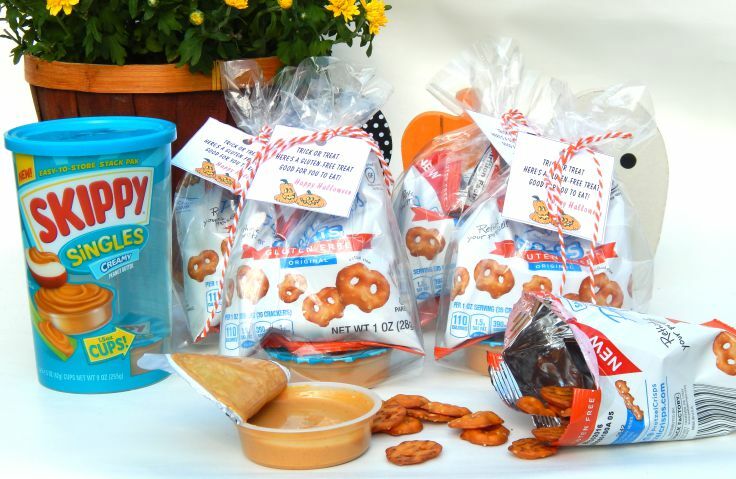 I paired the creamy sweet and delicious Skippy Singles Cups with Gluten-Free Crunchy Pretzel Crisps. The Mini Pretzel Crisps are great for dunking into the Skippy Creamy Peanut Butter. 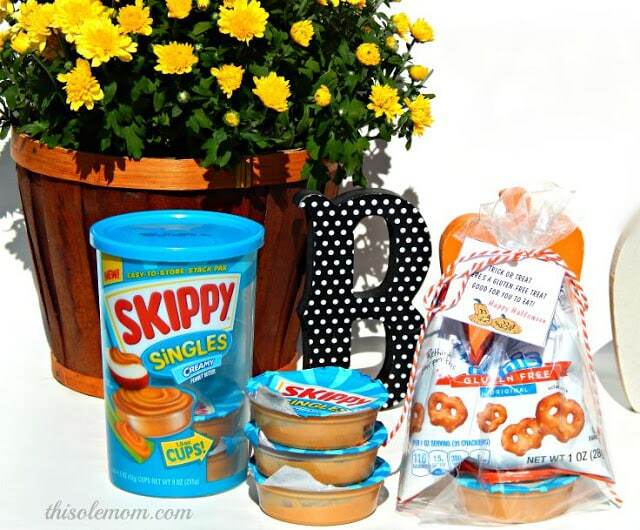 Skippy Singles is the perfect size to put in treat bags, and the cups have just the right amount of Peanut Butter for a snack. I made cute gift tags to put on the Halloween Treat bags. 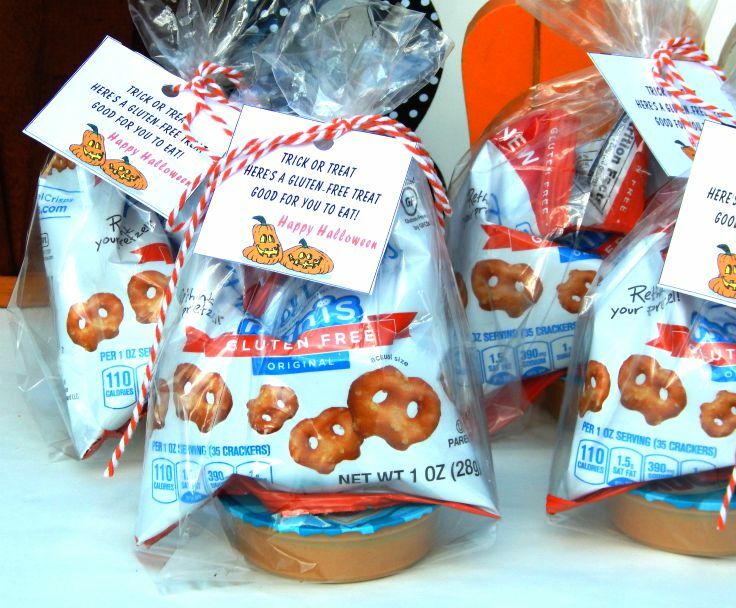 The gift tags are a great way to let kids and their parents know the contents of the bag is Gluten-Free. I love that I can offer an alternative and know that the treats inside the bags are delicious. 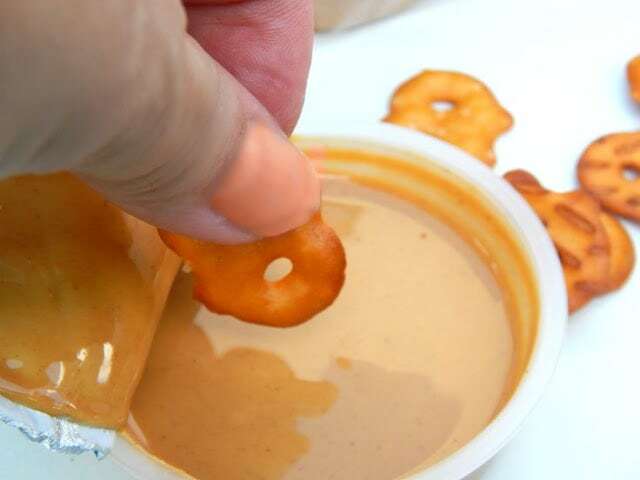 If you’re anything like me, you’ll just eat the Peanut Butter out of the cups with a spoon and not worry about the Pretzels. 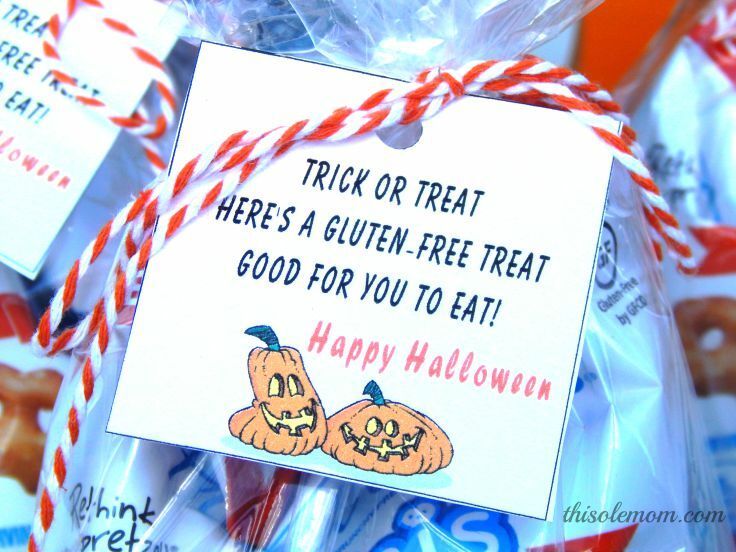 You can download the printable free here to use to make your Gluten-Free Treat bags. Once you printed out the gift tags follow the line and cut it out, use a hole puncher to make a hole in the gift tag. 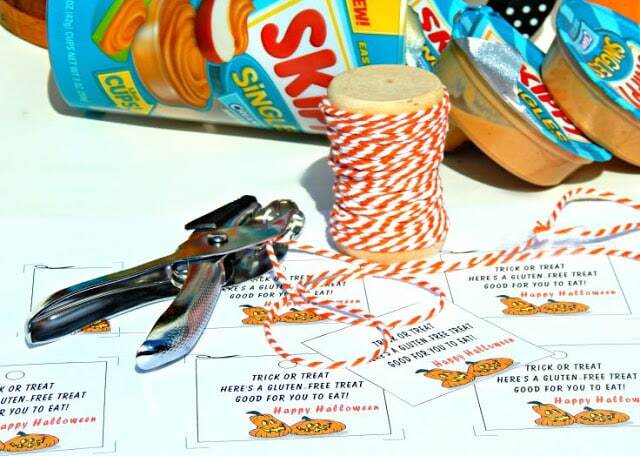 Tie the gift tag to the treat bag using baker’s twine. Stand back and admire your Skippy Singles Peanut Butter Gluten-Free Halloween Treat Bags. 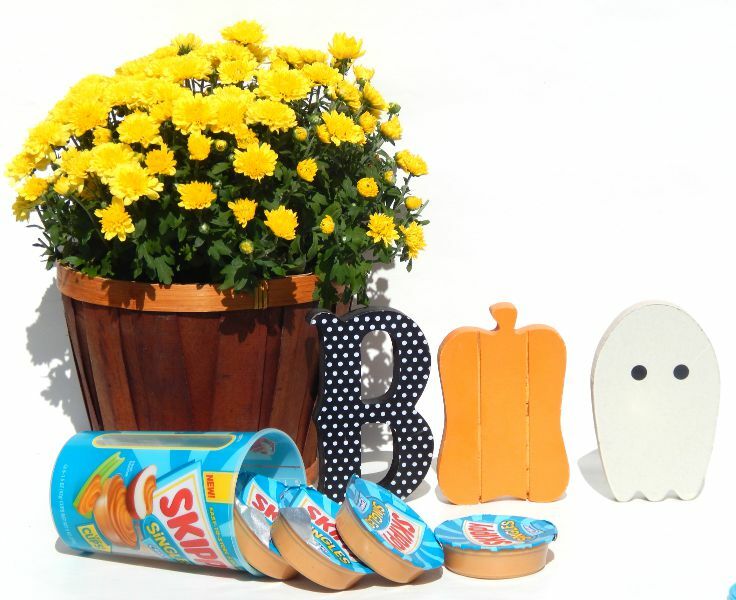 You now have a delicious treat to hand out for Halloween or use as Halloween Party favors. 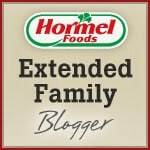 Connect with Hormel Foods on Facebook or twitter . This is such a great idea Kim! 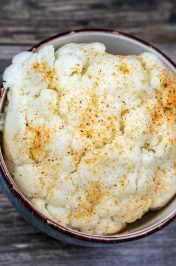 I love Hormel Foods, they offer so many gluten free options. Nice to know little ones with celiacs can still enjoy Halloween with these cute treat bags! Kim, I forgot to ask you, where did you find your treat bags at? They are the perfect size! This is a really good idea. I never thought of having separate treats for the gluten free families in my hood! I used to love receiving little baggies of stuff as a trick-or-treater. This is great for adults, too. Love the idea! I love this idea! Peanut butter is such a nice, healthy snack with pretzels or crackers! Thank you so much! 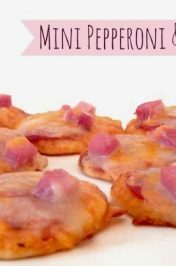 I wanted to make something that children that couldn't have gluten would enjoy but be a good snack for everyone else, too. 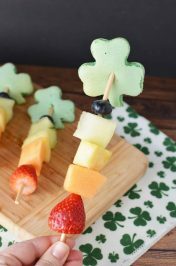 Love this alternative choice to candy! 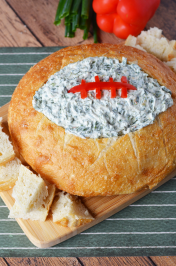 Our family is gluten free so this treat would be greatly appreciated!